The French are supposed to be a secular culture -- it's in their constitution . So I was surprised to discover when we arrived in the city of Lyon on Aug. 15 that the town was pretty much closed down, because it was the Feast of the Assumption. 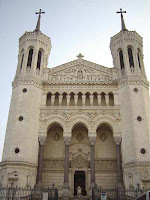 Not only that, the basilica -- Notre Dame de Fourviere -- was packed. We could hear the sermon amplified outside. French historian Nathalie Caron notes the paradox of a secular state with a Catholic culture that celebrates a significant number of religious holidays. But cultural practices don't offer evidence of active belief. France is historically Catholic; hence its beautiful cathedrals. In the U.S., scholars refer to our "civil religion" -- which has been misinterpreted to mean that America is (and was) an actively practicing Christian nation, as opposed to one with historic ties to a large number of Christian denominations.